The Liberhan commission, which took 17 years to complete its inquiry, held several senior BJP leaders responsible for the demolition of the Babri masjid. And come down it did. On the fateful afternoon of 6 December 1992, hundreds of Hindu fundamentalists tore down the Babri masjid, which stood on a site in Ayodhya believed to be the birthplace of Lord Ram. Ten days after the demolition of the three-domed structure, the Congress-led Central government set up a commission under Justice Manmohan Singh Liberhan, then a sitting judge of the Punjab & Haryana High Court, to investigate the events that led up to it and identify the people involved. The commission, which got 48 extensions, led what became the longest running inquiry in Indian history. It submitted its report to then Prime Minister Manmohan Singh on 30 June 2009. The report minced no words in indicting senior leaders of the Bharatiya Janata Party (BJP) — from former Prime Minister Atal Bihari Vajpayee to Kalyan Singh, the chief minister of Uttar Pradesh at the time of the demolition — along with the Rashtriya Swayamsevak Sangh (RSS), the Vishva Hindu Parishad (VHP), the Bajrang Dal, and the Shiv Sena. Liberhan said a deeply-rooted nexus of state authorities was complicit in encouraging the violence that claimed hundreds of lives. The delayed action of the Centre further compounded the situation, it added. The demolition, it noted, “reduced one of the oldest civilisations to a state of stark intolerance and barbarianism — all for petty political gains”. Saying the perpetrators were “vying for the fame of blowing up the structure” and the desire for complete “political power”, the report drew the inference that the agitation for the construction of a Ram temple at the site was a “non-event” that took the tones of a “movement” only once the BJP joined the fray. The report squarely holds a “handful of malevolent leaders” masquerading as “moderate elements in the Sangh Parivar” responsible for invoking the name of Ram to turn tolerant peaceful communities into “intolerant hordes”. “It cannot be assumed even for a moment that (BJP patriarch) L.K. Advani, A.B. Vajpayee or (veteran BJP leader) Murli Manohar Joshi did not know the designs of the Sangh Parivar,” read the report. “The BJP was therefore an essential ingredient in the Parivar smorgasbord and essential to capture de jure power and authority, in furtherance of its goal of establishing a Hindu Rashtra,” it added. Nine years after the report was submitted, ThePrint looks at some of the observations made by the panel against senior politicians, most of whom remain on trial for the “criminal conspiracy” that continues to animate Indian politics to this day. The commission noted that the VHP kicked off its ‘Ram Janmabhoomi Mukti Andolan’ after a meeting Vajpayee and Advani, along with leaders of the RSS and the VHP, held with then PM Narasimha Rao in the days before the demolition. Believed to be a driving force of the demolition, Advani found mention on every other page in the report. From mobilising support for the cause through his rath yatra to making several incendiary speeches — the Liberhan panel noted that Advani “infused life into the issue”. As the crowd pushed ahead on 6 December, Advani and Uma Bharti, among others, reportedly appealed for restraint. But the commission questioned whether these were for the benefit of media or genuine appeals. The commission holds that Advani’s 1990 rath yatra gave an impetus to the Ram Janmabhoomi movement. “It brought the BJP and its allies to power in many states in 1991,” it added. Joshi served as the president of the BJP between 1991 and 1993. The report noted that Joshi, along with the then UP chief minister Singh, visited Ayodhya to pay obeisance at the controversial site in July 1991, where slogans like “Ram lalla hum aayein hain, mandir yahin banayenge (Ram lalla, we have come, will build the temple here)” were raised. According to the commission, they took an oath to construct the Ram temple at the site, along with the people present there. “Joshi added strength to the process of mobilisation and the participation of the government and the state or the political executive for the mobilisation carried out continuously, at least since 1989,” the report added. Singh assumed office as the Uttar Pradesh CM in 1991, and his government went on to acquire 2.77-acre Ram Janmabhoomi-Babri masjid complex. The failure of his state administration to prevent the demolition, and alleged complicity in the sequence of events, is central to the Liberhan report. The report noted that Singh transferred officers who were not in favour of the move. 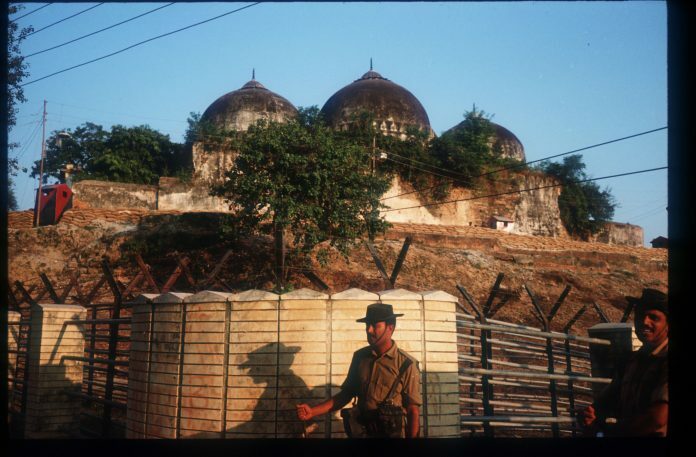 According to the commission, 90 per cent of the police personnel deployed to protect the Babri masjid were sympathisers, and the rest under strict orders not to use force against kar sevaks. “The chief minister was the pivotal figure and played the key role in the whole episode of demolition and the temple construction movement,” the Liberhan commission added. The decision of the late Shiv Sena founder to ally the party with the movement is also categorically pointed out by the commission. “It was announced that the kar seva was not going to be merely symbolic, but actual kar seva by actual construction of the temple,” the report read. The Shiv Sena was one of the parties “vying for the fame of blowing up the structure (masjid)”. The report noted that mobs often didn’t distinguish between what is right and wrong, and blamed the state and people identified for inciting them. It recommended that a government formed on the premise of religion or which has religious issues on its political agenda must “be barred”. Such a government, it added, fell foul of the “explicit and implicit proscriptions of the Constitution”.